Original Editors - Cassie Shay from Bellarmine University's Pathophysiology of Complex Patient Problems project. Sjogren's syndrome was first described by physician Henrik Sjogren in the early nineteen hundreds to explain the signs and symptoms of a group of women exhibiting chronic arthritis along with extremely dry eyes and dry mouth. It is now understood that Sjogren's syndrome is an autoimmune connective tissue disease in which the body's own immune system attacks moisture producing glands, causing inflammation in addition to reduction in both the quality and quantity of the glands' secretions. As observed by Dr. Sjogren, the glands responsible for producing saliva and tears, the salivary and lachrymal glands respectively, are the organs most notably impacted by the disease. However, Sjogren's syndrome is a systemic disorder in which many organs may be affected, including kidneys, gastrointestinal tract, blood vessels, respiratory tracts, liver, pancreas, and central nervous system. Additionally, it is considered a rheumatic disease, like rheumatoid arthritis or lupus, and similar to these diseases Sjogren's syndrome can cause inflammation in joints, muscles, skin, and other organs. 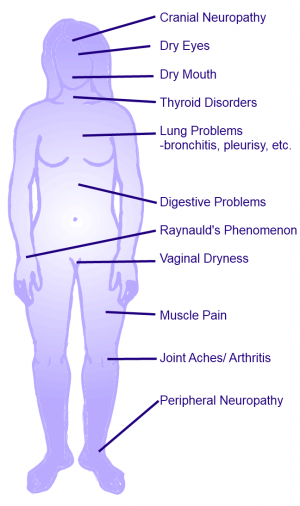 Sjogren's syndrome is the second most prevalent autoimmune rheumatic disease. In 2008, it was estimated that 1.3 million Americans were affected. Statistics from rheumotology clinics indicate that Sjogren's syndrome affects 0.5 - 1% of the general population, and approximately the same number of people have been diagnosed with Sjogren's syndrome and Systemic Lupus Erythematosus. Although, it can affect individuals of all genders and ages, including children, symptoms usually occur in women between the ages of 45 and 55 years old. In fact, it is estimated that nine times as many women are affected when compared to men. Among individuals with rheumatoid arthritis or systemic sclerosis, thirty percent have histological evidence of Sjogren's syndrome. Patient's with Sjogren's syndrome can present with a number of complaints. However, the most common symptoms of this autoimmunue disease are dry mouth and dry eyes. These complaint may be considered mild in comparison to the symptoms commonly associated with other autoimmune diseases, such as rheumatoid arthritis. However, the dry eyes and dry mouth associated with Sjogren's syndrome can be quite severe. In SS, the extreme dry eyes is called keratoconjuctivitis sicca (KCS), and individuals may describe it as a dry, burning, or gritty feeling, as though they have sand in their eyes. The excessive dryness in the mouth, also known as xerostomia, may make it difficult to speak, swallow,chew, or it may make foods taste differently. Raynauld's phenomenon secondary to Sjogren's Syndrome. Photographed by Milorad Dimic, MD. Approximately half of patients who have been diagnosed with Sjogren's Syndrome have also been diagnosed with rheumatoid arthritis, lupus, or some other connective tissue disorder. Fewer people may also experience Sjogren's in association with lymphoma. As more research is developed on the topic, more and more co-morbities are being associated with SS. Recent studies suggest that clinical depression is also common among individuals diagnosed with this disease. Secondary Sjogren's is a form of the syndrome which develops after the presentation of a primary disease, usually another autoimmune connective tissue disease. Common primary diseases associated with Sjogren's Syndrome are listed in the table below. Polymyositis Inflammation of muscles that cause pain, weaking, and difficulty moving. If the skin is involved too, it is called dermatomyositis. Rheumatoid Arthritis Severe inflammation of the joints caused by the bodies own immune system attacking the synovium located throughout the body. Scleroderma Accumulation of too much collagen, resulting in thick, tight skin, and possible damage to joints, muscles, and internal organs. Systemic Lupus Erythematosus An autoimmune disease in which the patient may experience joint pain, muscle pain, fatigue, weakness, skin rashes, and possibily even heart, lung, kidney, and nervous system issues. Lymphoma Although rare, there is a small percentage of individuals with Sjogren's whom also have lymphoma, which is cancer of the lymph system. This can affect salivary glands, lymph nodes, the gastrointestinal tract, and lungs. There is no cure for Sjogren's syndrome, therefore its symptoms are managed through medications, both prescription and over the counter. A variety of medications may be used to treat each of the associated symptoms. Dry Eyes Clear Eyes, Visine Tears, etc. This table was created using information from the National Institute of Arthritis and Musculoskeletal and Skin Diseases and PubMed Health, see references below. The Schirmer's test assesses the function of the lacrimal glands by measuring the amount of tears they are producing. This test involves putting a strip of paper under the lower eyelid, waiting five minutes, then measuring how much moisture was absorbed by the paper. An individual who tests positive for Sjogren's syndrome will typically produce too few tears to get more than 8 millimeters of the paper wet. During a slit lamp examination an ophthalmologist magnifies and examines the eye for severe dryness and inflammation. This test may be performed in conjunction with a vital dye applied to the eyes to determining the extent to which the eyes may have been damaged secondary to the dryness. A mouth examination may be performed to determine if signs of mouth dryness are present. These signs may include, sticky oral mucosa, tooth decay and cavities in certain locations, thick saliva, and redness inside the oral cavity. The physician may also be able to note inflamed or under-producing salivary glands during this examination. A lip biopsy is a method used to determine if the dry mouth experienced by the patient is a symptom of Sjogren's syndrome. During this test, minor salivary glands are removed from the bottom lip and placed under a microscope. If the glands contain a certain arrangement of white blood cells, the test is positive for the salivary component of Sjogren's syndrome. Blood tests may be performed to determine the presence of antibodies and immunological substances often found in individuals positive for Sjogren's. Antibodies commonly present in affected individuals include immunoglobulins, antithyroid antibodies, rheumatoid factors, antinuclear antibodies (ANA), and Sjogren's antibodies. Chest X-Rays are a method used to examine for inflammation of the lungs, which may be present in Sjogren's syndrome. A urine analysis may also take place to determine if the kidneys are functioning properly. 1. Have you had daily, persistent, troublesome dry eyes for more than 3 months? 2. Do you have a recurrent sensation of sand or gravel in the eyes? 3. Do you use tear substitutes more than 3 times a day? 1. Have you had a daily feeling of dry mouth for more than 3 months? 2. Have you had recurrently or persistently swollen salivary glands as an adult? 3. Do you frequently drink liquids to aid in swallowing dry food? IV. 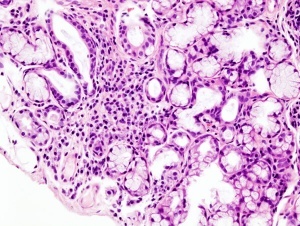 Histopathology: In minor salivary glands (obtained through normal-appearing mucosa) focal lymphocytic sialoadenitis, evaluated by an expert histopathologist, with a focus score greater than or equal to 1, defined as a number of lymphocytic foci (which are adjacent to normal-appearing mucous acini and contain more than 50 lymphocytes) per 4 mm2 of glandular tissue. Digital camera shot of human acinar cells through a microscope. eyes and dry mouths, are a result of the destruction of the exocrine (lacrimal and salivary) glands by focal T-lymphocytic infiltrates. T-cells and B-cells are components of the immune system and usually work together to detroy foreign structures in the body, such as viruses and bacterias. However, in autoimmune diseases, such as Sjogren's syndrome, these cells interfere with the function and structure of organs within the body. In the case of Sjogren's, these cells interfere with glandular function. Regulation of the salivary glands by the nervous system is impaired, and the secretory acinar apparatus displays structural abnormalities. The acinus is the terminal end of the exocrine gland where the secretions are produced. The membrane of this structure lacks the laminin alpha-1 chain, which may explain this organ's inability to induce differentiation of the stem cells into acinar cells. Evidence in the pattern of cases suggest that the cause of Sjogren's syndrome has a genetic component. Recent research has found that the same gene variant commonly present in individuals with other connective tissue diseases, such as RA and lupus is also associated with Sjogren's syndrome. The discovery of the STAT4 gene variant in association with autoimmune diseases could lead to a number of cutting edge treatments, including the possiblitly of gene replacement therapy to combat these incurable conditions. As with other autoimmune diseases, scientist believe that Sjogren's may be triggered by an infection in individuals with a genetic predisposition. This infection jump starts the the immune system. However instead of calming down when the infection is eraticated, the immune system continues to remain on high alert, and starts to destroy the body's own cells. Common medical practice revolves around medication to treat Sjogren's syndrome. Specifically, physicians aim to control the dry eyes using substitue topical agents and manage extraglandular symptoms with glucocorticoids and immunosuppressive drugs. Many of these pharmaceutical therapies can be seen in the Medications section of this page. Current evidence does support frequently using preservative free tear substitutes to treat dry eyes during the day and using the ocular lubricating ointment at night. The ointments are not suggested for day time use secondary to the application producing blurred and cloudy vision. The treatment recommended to a patient may depend upon the severity of the patient symptoms. To treat moderate to severe dry eyes associated with Sjogren's syndrome, controlled trials support the application of topical 0.05% cyclosporine two times a day. Topical NSAIDs or glucocorticosteroids may be required for the patients suffering from severe refractory ocular dryness. In extreme cases of severe dry eyes, a patient my elect to undergo a punctual occlusion. This is a surgical percedual attempts to keep the natural tears over the surface of the eye by closing the tear ducts that drain said tears from the eye. If a patient presents with contraindications for these therapies or is not tolerant of these medications, it has been found that N-aceylcysteine is an acceptable alternative. The studies supporting the use of glucocorticoids and immunosuppressants have been small providing limited evidence for the prescription of such therapies. However, Rituximab has been shown to improve some extraglandular symptoms, including vasculitis, neuropathy, glomerulonephritis, and arthritis. Individuals with Sjogren's syndrome have reduced physical capacity and tend to fatigue very easily. While research on the effects of exercise on individuals diagnosed with Sjogren's is limited, the available studies suggest these patients benefit from moderate to high-intensity levels of exercise. This type of activity has a positive influence on aerobic capacity, fatigue, physical function, and mood. Further research is required to understand the effects exercise may have on individuals with varying severities of this disease, and to determine the longterm effects exercise may have on their symptoms. However, one of the musculoskeletal presentations of SS is muslce and joint pain, along with arthritis. Thererfore, a patient may be treated by a physical therapist to relieve these symptoms. Szturmowicz M, Wilinska E, Paczek A, et al. Primary Sjogren's syndrome with two extraglandular sites involvement-case report. Pneumonol. Alergol. Pol. 2010:78;445-450. Ahmada Y, Shahrila N, Husseina H, Said M. Case review of sarcoidosis resembling Sjogren's syndrome. Journal of Clinical Medicine Research 2010:2;284-288. Moutasim K, Shirlaw P, Escudier M, Poate T. Congenital heart block associated with Sjogren syndrome: case report. Internal Archives of Medicine 2009:2;21. ↑ 1.00 1.01 1.02 1.03 1.04 1.05 1.06 1.07 1.08 1.09 1.10 1.11 1.12 1.13 1.14 American College of Rheumatology. Sjogren's Syndrome. http://www.rheumatology.org/practice/clinical/patients/diseases_and_conditions/sjogrens.asp (accessed 17 March 2011). ↑ 2.00 2.01 2.02 2.03 2.04 2.05 2.06 2.07 2.08 2.09 2.10 2.11 2.12 2.13 2.14 2.15 2.16 2.17 2.18 2.19 2.20 2.21 2.22 2.23 2.24 2.25 2.26 2.27 2.28 2.29 National Institute of Arthritis and Musculoskeletal and Skin Diseases. Sjogren's Syndrome. http://ww.niams.niih.gov/Health_Info/Sjogrens_Syndrome/default.asp (accessed 17 March 2011). ↑ 3.00 3.01 3.02 3.03 3.04 3.05 3.06 3.07 3.08 3.09 3.10 3.11 3.12 3.13 3.14 Goodman C, Fuller K. Pathology: Implications for the Physical Therapist. 3rd ed. Denver, CO: Saunders, 2009. ↑ PubMed Health. Drugs and Supplements. http://www.ncbi.nlm.nih.gov/pubmedhealth/s/drugs_and_supplements/a/ (accessed 6 April 2011). ↑ 7.0 7.1 7.2 7.3 7.4 7.5 7.6 7.7 7.8 Ramos-Casals M, Tzioufas A, Stone J, Siso A, Bosch X. Treatment of primary sjogren syndrome: a systemic review. JAMA 2010;304:452-460. http://jama.ama-assn.org/content/304/4/452.long (accessed 17 March 2011).